I was a bit bummed last week when my sister texted me and said she would be having a meal of fresh peas in the next day or two. Not getting my garden in until almost Memorial Day has meant more waiting than I’m used to. So, I was pleasantly surprised to see quite a few flowers on the peas and beans Sunday. Hopefully, warm, humid weather in the forecast will mean peas in the pod on our dinner table soon, too! The onions are a lot smaller than last year’s crop. Carrots and potatoes picked today. I found these volunteer tomatoes beneath a bunch of weeds. Cassie came by the garden just in time to eat a few raspberries. I was able to spend a little time in the garden this afternoon before the rain set in. Well, it wasn’t really rain – more like heavy sprinkles – but enough to keep me inside. It was a strange kind of day in the weather department. Off in the distance, it thundered and there was lightning, but not only did we not get any heavy rain at our house, the sun was shining most of the time. Pretty, puffy light clouds juxtaposed with a dark sky and heavy gray clouds. Like I said, strange. At the beginning of July, I made a promise to myself that I’d pay more attention to the garden. June had been a less-than-stellar month in terms of my caretaker responsibilities, and I knew that I needed to kick it into high gear if I was to get any “booyah” out of the garden. Given the extreme heat we had all month and the lack of rain during the last half of June and first half of July, my garden needed all the help it could get. 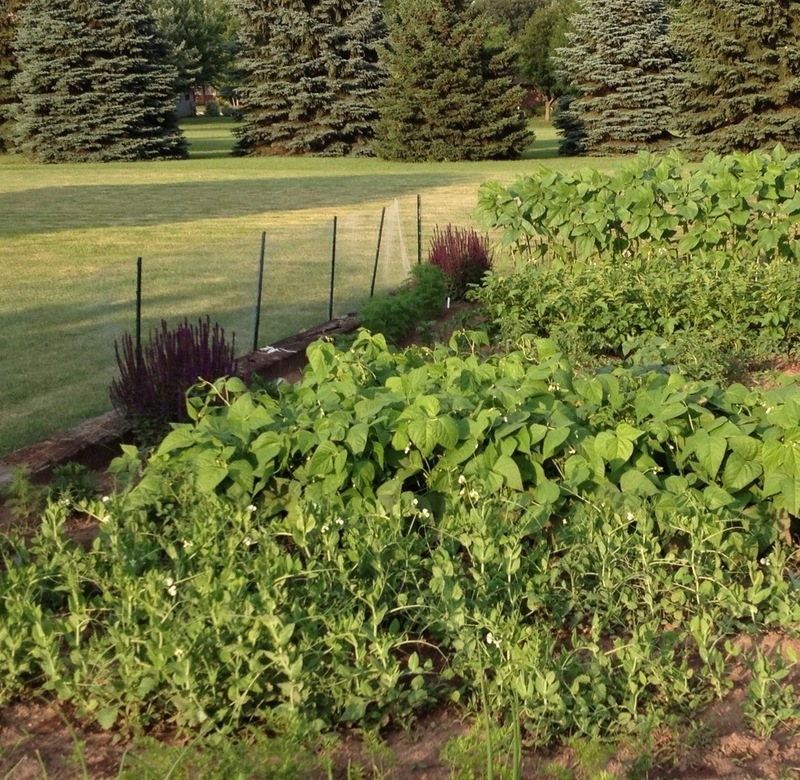 Early on in July, I enjoyed the heat and the way it helped the garden grow with the help of my sprinkler. By the second week of July, the heat got to be pretty overbearing on everyone and everything. Watering the garden helped, but it was clear it couldn’t replace the real thing. I’ve always had orange lady bugs before today. Picking them before they’re really red so varmints can’t nibble on them. Only a few raspberries left; they were good while they lasted. Jeepers is the energizer bunny of pumpkins! Looking east: I think it’s time for the dried pea vines to go, don’t you? Looking west: Fingers crossed for more red soon! Since my tomatoes have been kind of slow to ripen, my sister brought me some of hers Saturday. Oh my gosh, are they good! I expected just a couple, but instead she gave me about two dozen. We had BLTs for lunch, I had a slice on my burger for supper and plan on having a plateful before I go to bed tonight.